In my last stellar evolution post, I went through a quick version of the life and death of stars. Here, we’ll explore a bit more of the current understanding of all this. Namely, how do astrophysicists support the stellar evolution theory, when we can’t actually create stars in labs and fast forward time to watch the process unfold before our eyes, or even resolve the surface of more than a handful of stars aside from our sun? Let’s start off with what we can observe pretty directly. As I’ve mentioned before, looking at the spectra of stars, we can learn what they’re made of, at least at the surface. As you’re probably aware, stars are gigantic balls of primarily hydrogen. There’s about 20% helium, and 1% other stuff. Another property we can obtain pretty directly is the mass of a number of stars. To do this, we look for stars in binary systems. From there, we observe the period of the stars around the center of mass. Using Kepler’s laws, we can derive the ratio of masses. But while the ratio is all well and good, we’d like to know the masses of each one independently. Fortunately, nature occasionally provides us with the ability to make another set of observations, which fully solves the system of equations. About 50% of stars in our galaxy seem to appear in binary systems. Statistically, some of them will have planes of orbit that align with the Earth. That is to say that, from Earth, we the stars eclipsing one another. Such systems are known as eclipsing binaries. The reason they’re useful is that as the stars orbit around one another they will be moving towards Earth for part of their orbit, and then heading away for another part. By measuring the doppler shift we can measure the precise speed with which the stars are orbiting. Lastly, we can determine the ratio of sizes from the period of the eclipse. If, for the sake of example, we assume that one star is smaller, as it passes in front of the larger star, it will block the light from the larger causing a dip in the overall brightness as long as it’s in front of the other. As it passes behind the larger star, there will be another dip in brightness as the larger star blocks the light from the smaller. If you want to play with some computer simulations of these objects, try checking out StarLight Pro. It can be use for real life astronomy, but it’s fun to play with even if you don’t know what you’re doing. Put all these observations together, do some math, and you can pop out information such as radii, and relative brightnesses. But these aren’t the only features we know. As I described in this post we can also determine surface temperature and distance. So there’s three intrinsic quantities we have right there: Radius, chemical composition, and temperature (at least for the surface for the latter to). This gives astrophysicists a starting point. From there we can start building models and make up our temporal limitations through mathematics. I don’t intend to go into the math here, as there’s not nearly enough room. After all, my entire astronomy course for last fall was just doing the basics of all this math for the atmospheres of stars. So cutting all of that out, let’s talk about some of the things these models predict that we can confirm observationally. One of the things that the models make perfectly clear is that stars do indeed evolve over time. It also makes it clear that the more massive the star, the faster it will evolve and die. Observationally, this should mean we see less high mass stars than we do low mass ones. They’re simply not around long enough for us to see many. This is something we observe very distinctly. Another extremely important prediction of these models is to let us know how these stars will evolve across the H-R diagram. The models tell us that stars will spend most of their life (~90%) of their lifetimes all along a single line we call the main sequence. Thus, when we look around, we should see that same amount of stars on this line. If you look at this H-R diagram that line jumps out as the diagonal conglomeration running from the upper left to the upper right. The main sequence isn’t drawn in on this graph, but you can get a feeling for where it is. Again, it’s running from the upper left to the lower right, going through those filled circles labeled 1 on each track. The masses are listed next to those points in units of solar masses (the circle with the dot in it is the symbol for Sun). Let’s look at some of those other points for a minute. The points labeled one are when hydrogen fusion first starts in the core. This marks the beginning of the star’s life and is known as the “Zero Age Main Sequence” or ZAMS. From there, the stars are slowly evolving to point two, which is where the core runs out of hydrogen. As we can see, this evolutionary process requires that the main sequence have some width to it. If you look back at that H-R diagram I linked to earlier, you’ll see this is precisely the case. From points two to three, this is the phase of contraction until the point where the area outside the core gets hot enough to initiate shell fusion of hydrogen. This kicks the star over to point five pretty quickly in astronomical time scales (something like 1% of the time the star spent on the main sequence). So here we have another prediction: We shouldn’t see many stars in this region of the H-R diagram. Again, observations confirm this. This sparsely populated region is known as the Hertzsprung Gap. The rest of the points start getting horribly complicated so I’ll skip out on those, although that's not to say that complicated means impossible. However, it should be noted that we can’t watch a single star go along these tracks. Fortunately, there’s another way to plot the data that gives us a whole different way to analyze the data. In this plot, we looked at position on the H-R diagram for different stars across time at constant masses. 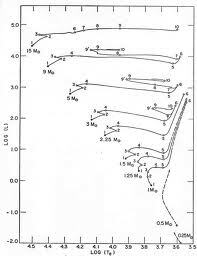 Alternatively, we can look at position on the H-R diagram for different stars across mass at constant time. Such diagrams are known isochrones (meaning same time) and I’ll explore them in my next post. Recapping what we learned from this post, a good number of predictions can, and are, made based on these mathematical models based on an extremely solid understanding of physical laws. The observations, thus far fit very well, so stay tuned to see how well they stack up for other tests. Actually, you can't really determine the radii of stars by comparing the depths of the eclipses; you can only constrain the ratio in the surface brightnesses. On the main sequence, this correlates with mass, which in turn correlates with radius, but it's not necessarily pretty (or well-known, for that matter...). You might also want to point out that the H-R diagram isn't a plot of H v. R (which I'm sure you do in that other post); it's always good to mention what the axes on plots are. And how are the rest of the points "not exciting"?? That's where all the action is! And the majority of the light in a non-star-forming cluster of stars/galaxies! Thanks for pointing that out. I knew something didn't feel right about that, but I wasn't sure what. I even went looking for confirmation. That's what I get for trusting an intro level source that leaves out those details. Agreed on the H-R diagram. It's something I'm so familiar with that I never even thought of. I'll ammend that. As far as those last points, what I should say is they're horribly complex, with all sorts of things going on that I really just didn't want to get into. For the point I was trying to get across, I feel that what I had is sufficient. I'll ammend my word choice. And lastly, why do you always reply so damned quickly? Are you stalking me? Don't you have something better to be doing? It's a Friday night after all! On the other hand, I could try to be quick and annoying, like Stephen whats-his-face. Or, not. Trolls are not welcome here. There’s about 20% hydrogen, and 1% other stuff. and annoying, like Stephen whats-his-face. Hey :) I would like to ask something not conserning to Astronomy; may I ??? Why did you or you are calling yourself "Angry Astronomer" ??? Astronomer, okey I understand but why angry ??? Why did you or you are calling yourself "Angry Astronomer"
That question is answered in this post. Hey, when did that happen? So... which is it again?